At one point in his life, Golden Era Games' Cleveland Mark Blakemore worked as a contractor on a canceled Wizardry title. That experience left such a sour taste in his mouth that he set out to create a better Wizardry-style game all by himself. And while usually such harebrained, resentment-fueled projects get abandoned within the first two weeks, Cleve stuck with it and continued to work on that game until it was finished. 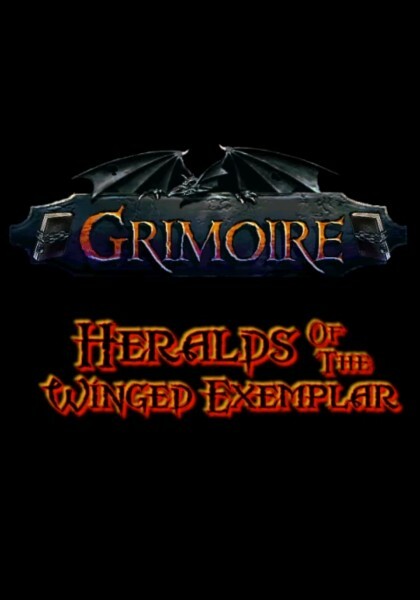 It took him over 20 years, but on August 4, 2017 Grimoire: Heralds of the Winged Exemplar was released. Then, on December 23, 2018, Grimoire received a massive update that can easily be considered an expansion. This update, simply designated as V2, added and overhauled numerous features and introduced a good deal of new content to Grimoire. The update also lowered the game's price to $19.99, so I figured I simply owed it to myself to pick Grimoire up and see if this golden baby could fly. At its core, Grimoire is a grid and turn-based first-person dungeon crawler inspired by such games like Wizardry, Might and Magic, and Eye of the Beholder. Your party of up to eight adventurers explores the game's world one square at a time, delves into trap and puzzle-filled dungeons, fights all sorts of deadly beasts and nefarious evildoers, pockets countless ancient artifacts, rides on turtles, and saves the world. All this takes place in Hyperborea, a mythical land situated at the center of the cosmos. Placing his game at the center of creation, allowed Cleve to easily combine the tried and true fantasy tropes like dwarves, wizards and fairies, with a good deal of out there elements like flying interdimensional babies, alien bounty hunters, and ancient mythologies. With a setting like this, it makes perfect sense that the game doesn't take itself too seriously. You will often encounter humorous events, the game's narrator will amuse you with witty observations, and you'll even stumble onto occasional literary references. And in more practical terms, such a rich setting results in 14 playable races, 15 classes with 11 attributes and over 40 skills, and a wide assortment of spells that do damage, apply status effects, heal your party, and assist you in exploration. The latter are especially important because the game is absolutely packed with secrets, hidden switches and illusory walls, and oftentimes critical stuff is hidden behind those. As a result, you will want to have the Detect Secret spell going at all times. This leads us to one of Grimoire's strong suits – while the game can be fairly challenging even on the lowest of its 5 difficulty settings if you don't know what you're doing, it also gives you plenty of tools to circumvent this challenge. Can't find an item on a map? Cast the Locate Item spell. An NPC is being difficult? Charm them and read their mind. Can't penetrate your foes' defenses? Enchant your blades. Don't like the lockpicking minigame or don't have a character with the right skills? Cast the Knock Knock spell and laugh all the way to the bank. And overall, Grimoire is extremely dense with features, mechanics and content. Perhaps my favorite of those is being able to make your own notes directly on the game's map. This is a sorely underutilized feature these days and I wish more games had it. When it comes to exploration, this feature density translates into an astonishing number of secrets, puzzles, and points of interest. Unfortunately, some of Grimoire's mid game areas got the short end of the stick there and feel like they could have used a bit more attention. But then again, the V2 release added a bunch of new areas and those are all among the best the game has to offer. Having said that, at times Grimoire can go a bit overboard with its features. Take item descriptions for example. You can “look” at an item to learn what it is, you can “Identify” or “assay” it to find out what it does, and you can also “Improved Identify” it to get some additional information. But then you can also find oracles that reveal even more info. If you “Improved Identify” an item that's unidentified, you get the same result as when using an oracle. But if you do this to an item that's already assayed - you don't, and this is where things get a tad too fiddly for my taste. Additionally, a few of the game's puzzles and riddles can be too obtuse for their own good, to the point where I had to look up how to progress a couple of times. Thankfully, by now Steam offers several detailed guides that can act as walkthroughs for when you get stuck.